Eocene fossil is oldest-known social parasite of ants, correlates with the ecological rise of modern ants. Scientists have exposed the fossil of a 52-million-year-old beetle that was probably able to live alongside ants- preying on their eggs and seizing resources- within the comfort of their own nest. 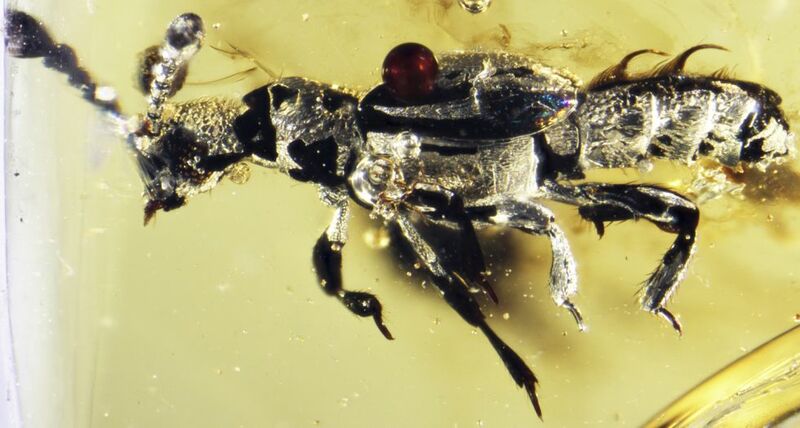 The fossil, enclosed in a piece of amber from India, is the oldest-known example the type of social parasitism, known as “myrmecophilly.” The research was published yesterday in the journal, Current Biology, and indicates that the diversification of these stealth beetles, which infiltrate ant nests across the world today, correlates with the rise of ecological ants. Today, there are approximately 370 described species belonging to Clavigeritae, a group of myrmecophilous, or “ant-living” beetles approximately 1-3 millimetres long, and Parker has estimated that several times this number of species still are waiting to be discovered. Extraordinary adaptations allow these beetles to bypass the fortress-like security of ant nests, which retain a pheromone code of recognition that ants use to identify, and then dismember and consume, intruders. Through what scientists are still trying to comprehend, Clavigeritae beetles pass through these defences and integrate seamlessly into colony life. Clavigeritae beetles’ appearance is quite different from their closest relatives, with fusions of segments within the abdomen and antennae- likely meant to provide additional protection from the ants, which often pick the beetles up and carry them around the nest- and mouthparts that are liquid food from worker ants. They also have glands that cover the body with oily secretions, and thick brushes of hair on top of their abdomens, called trichomes, which act as candlewicks and conduct chemical-containing secretions from nearby glands. The makeup of these chemicals remains unknown, but they are thought to encourage ants to “adopt” rather than attack the beetles. “If you watch one of these beetles interact inside an ant colony, you’ll see the ants running up to it and licking those brush-like structures,” Parker said. Despite Clavigeritae beetles being species-rich, they are quite rarely encountered in nature and so, unsurprisingly, the newly discovered specimen- brought to Parker’s attention by American Museum of Natural History curator David Grimaldi, the Eocene fossil is from an amber deposit in what was once a rainforest environment in what is now India. Although its body is very similar to modern-day Clavigeritae beetles, with two stark, hook-like trichomes, some of its characteristics are visibly more primitive. An example being, Protoclaviger’s abdomical segments are still distinct, whereas in modern beetles they are fused together into a single shield-like segment.